From innovation to communication, this client describes the seamless, headache-free, experience of working with the Backyard Boys. A reliable, hard-working team with enduring craftsmanship and unmatched customer service. Through visionary design, and an on-time, on-budget process, executed by our notoriously efficient, hard-working team, this originally unusable space was transformed into a dream backyard oasis beyond anything our clients had imagined. "Dane and his crew did an incredible job bringing our vision to life. Dane was able to work with us to create an outdoor living space that has exceeded our expectations. The crews were clean and courteous and willing to communicate with us through all stages of our project. 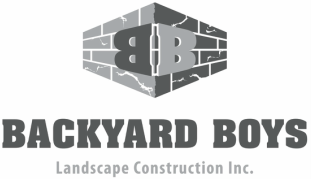 The Backyard Boys offer value, quality materials and professionalism. Thank you for enhancing our home. We would recommend Dane to anyone!" "After building our home eight years ago, we knew we needed 'a little something' to spruce up our backyard which is where we love to spend our spare time. The Backyard Boys came in to create a beautiful sitting wall with pillars that turned a plain concrete patio into a cozy, stunning family space. With the addition of a flagstone path leading to another matching patio we now have the backyard of our dreams. "Very pleased with the entire experience. Job completed on-time and on-budget. The Backyard Boys were fully dedicated to our project from the moment it began. They listened to our input and made great suggestions along the way. ​Would definitely recommend the team to anyone contemplating landscaping." ​"We are very pleased with the work done by Dane and his crew. His suggestions and designs were very helpful and resulted in a beautiful yard. We have had many people stop and compliment the landscaping around our new home. Dane was great to work with and always kept us informed on changes that were necessary and ideas that he had as the job progressed. We have no hesitation in recommending the Backyard Boys." "Dane is a true professional, in every sense of the word. Great guy, great work. I would strongly recommend Backyard Boys to anyone looking for the quintessential landscaping job." "Dane and the Backyard Boys were incredible from start to finish of my project. Dane was at my house within minutes of my initial phone call. Communication was great all the way through the project and I believe I received great value for dollar. I have and will continue to recommend the Backyard Boys to anyone who has any landscaping needs."